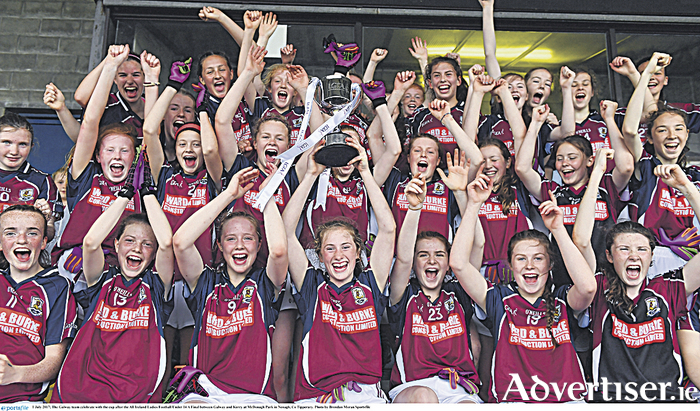 Galway celebrate success in the All Ireland Ladies Football U14 A final, overcoming Kerry at McDonagh Park in Nenagh, Co Tipperary. Galway athletes once again impressed on the national stage with two golds and a host of medals from the National Junior and U23 Track and Field finals in Tullamore on Saturday. Veronica Burke of Ballinasloe and District AC took gold in the U23 women’s 3k walk, a week after placing sixth in the British Race Walk 20k in a personal best time of 1hr 46 mins. Brendan Lynch of Loughrea AC also took gold in the junior men’s triple jump with a huge leap of 14.10 metres. It was another successful day at national level for Craughwell athletes Jerry Keary and Sinead Treacy as both athletes claimed bronze in their respective events, with Keary clearing 1.95m to take the bronze in the junior high jump and Treacy leaping 4.95m to take the bronze in the U23 long jump. Ryan McNelis and Patryk Woleniuk of Athenry AC both won national medals in the 400m hurdles, with McNelis running a new PB over the 59.54 for silver and Woleniuck claiming the bronze. Cillin Greene of Galway City Harriers won bronze in a superb time of 10.77 in a hotly contested junior men’s 100m race. The GCH 4x400m relay team took silver in the junior men’s relay, with Shane Canavan, Eanna Folan, Aaron Brennan and Thomas McStay the scoring four. Sean Kilmartin, Luke O'Shaughnessy, Diego Brule and Kacper Poniatowski of Galway City Harriers won gold in the U19 boys 4 x 100m relay at interclub relays for U12 to 19 juvenile teams in Athlone IT. GCH also won silver medals in the U18 girls in the 4 x 400m event, via Aoife Sheehy, Laoise Geraghty, Rita Lahue, Miriam Greene and Laura Nally, while the U14 took bronze medals, with some incredible running across the rounds from Gillian McGrath, Aoife Waldron, Leana Nic Dhonncha, Emma Moore and Ava McKeon. The GCH U14 boys placed fourth in the 4 X 100m relay final. The National Masters Track and Field Championships were held Saturday last in Tullamore and Galway athletes came home with a large medal haul across all age categories, which ranged from over 35 and upwards. Sean Breathnach (Galway City Harriers ), who competed for Ireland at the European Team Championships last week, won the M35 discus with 45.16m. Linas Mitkas of GCH claimed double gold with an impressive 42 metre throw in the M40 discus and he also took victory in the shot putt. Also in the field, GCH’s Cliff Jennings won triple silver in the M50 discus, javelin, and shot, and claimed bronze in the hammer, while Richard O'Hanlon took silver in the M60 shot putt. On the track, Peter O'Sullivan of Craughwell AC stormed home to a very impressive win in the M40 1500m, and also secured bronze in the 800m. Martin McEvilly of GCH continued his national winning streak, claiming gold in the M65 5000m, and also took silver in a hard fought 1500m. Kathryn Casserly of GCH won bronze in the 800m, while Majella Loftus also GCH claimed bronze in the 400m with a very fast finish. Andy Talbot of CRH won double bronze in both the 1500m, and 5000m. Maura Loftus of GCH race walked to silver in the F70 category in her first outing over the 3k distance. GCH relay squads came home with a large medal haul, with the ladies’ quartet of Majella Loftus, Sonya King, Jean O Connor and Kathryn Casserly, winning silver in both the 4x100m and 4x400m relays, while the men’s 4x400m squad of Neil O'Leary, Brian O'Connor, Eamonn Hornibrook and Ronan O Conghaile, claimed bronze. Tuam AC’s Justin Lane won silver in the hammer at M40 level, and bronze in the hurdles, while his clubmates Trish Monahan claimed shot putt bronze and Ian Egan M50 5000m bronze. Corofin's Peggy Higgins was the Galway athlete of the day, with an incredible six golds, winning the javelin, shot putt, discus, high and long jumps, and the hammer throw, in the F60 category. Thomas Farragher, also of Corofin AC, took double gold in the discus and hammer at Over 60 level, as well as silver in the weight throw and bronze in the shot putt.